Montana – Where Fly fishing Dreams Come True. I met Stefan on social media several years ago. I was and still do enjoy reading his witty, poetic, thought compelling post’s and impressive photography of his his home waters in Sweden and it’s stunning beauty. Being a career guide and a musician as myself I connected with Stefan and learned that he traveled to Montana every summer to this area and I invited him to come fishing. The rest is history as they say. I hope you enjoy this guest blog by my good friend Stefan Larsson. 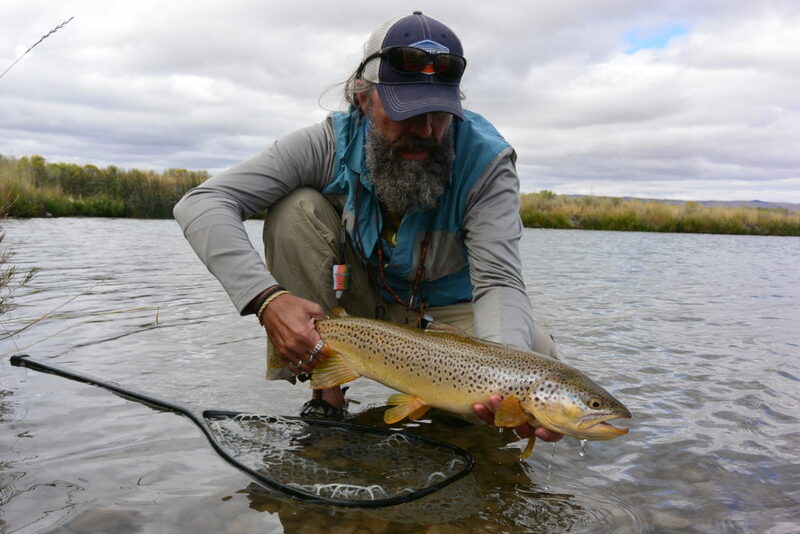 How a dry fly purist came to Montana and came to love streamer fishing. I was born and raised in Sweden, which obviously is quite a long way from Montana. Although separated by miles, the character of the lands is the same. I was raised with a fly rod in my hand and we lived close to a big trout river, or a bunch of rivers in different sizes actually. But since the big one was within walking distance, that was where it all started. As a young man I read every book about fly fishing I could find. 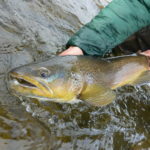 There were stories and tales from the American west and all those pictures of rocky mountains, wild animals and beautiful trout streams just seemed to be the place for restless and brave young men with fly rods in their hands. There was something about the American landscape that had caught my eye. For me that wild, rural and rugged part of America, called Montana, with all the mountains and trout rivers was stuck in my head and it soon became my little dream. Through the years I had become a dry fly fisherman, and for quite a while a “dry” was all I would allow to be tied on to my tippet. Somehow I ended up owning a small fly shop and a guide service on the river where I was raised. One day I saw this movie about a family who lived in southwestern Montana. The father in the film taught his sons to fly fish, just like my father had done. The film was called “a river runs through it” and it left me stunned and breathless. That was it! I knew on that day that I had to go. The dream had become the inevitable. It would take some years though before I made that first trip to Montana with a couple of my best friends. We drove around in a big Chevrolet for a month. Fished beautiful trout streams in the company of buffalo’s and drank cold evening beers on the porch. I was in heaven. I was already in love with brown trout but on that first Montana trip, I lost my heart again. I lost it to the little fish with the strange spots and a small red slash under his chin. The Cutthroat trout, which is one of the most beautiful pieces of art I’ve ever laid eyes on. Two years later I went back to Montana and a few weeks ago I got back from my seventh trip to Big sky country. Guess you could say I’m hooked for life. I’ve fallen in love with the land. The magnificent and beautiful, yet rugged, Montana nature, how can you not love it? The mountains and the plains. The endless amount of rivers. All the wonderful small towns. But most of all – the people of Montana. I’ve made some great friends over here during my trips and with time that has made my trips even more enjoyable. It’s not like just going somewhere fishing anymore, it’s fishing the rivers of my dreams and doing it with some of the best friends a man can have. Planning last year’s trip was a bit strange, since I was spending the first week in Montana by myself. Some words of uncertainty probably slipped my tongue and ended up on social media. Then, a message from Big Sky Country suddenly crash landed in my mailbox. I had talked to him a couple of times before in cyber space. This man from Sheridan, Montana, who apparently also had lost his soul to the art of fly fishing. Michael Stack, owner of Fishtales Outfitting. I looked at the name of the man who just invited me to come and fish with him in Montana. Two guides, only separated by a lot of dry land and an ocean. I gave it about two seconds of consideration before I loudly accepted. When I opened the motel door at 7 o’clock in the morning and let Michael into my room I kinda knew this was gonna be something different and I was right. I spent four absolutely outstanding days with Michael in southwestern Montana. We had so much fun and I just can’t remember the last time I had laughed that much. I actually slung more streamers on the riffle those few days than I had done in my entire life so far. Ending up with some glorious fights and a couple of trout that still turn up in my dreams. The day when we fought the wind from hell, and won, will forever be remembered. Flipping hoppers to hungry browns and rainbows on another river is probably one of the coolest dry fly days ever. But man, it was tough. Thank God for ice cold beer. Being out with someone who knows his waters like his own back pocket is just invaluable, especially if the conditions and outer circumstances are on the real mean side. And I mean to tell you, that Stack guy, he knows every little rock in those rivers. It doesn’t hurt that he’s a really, really nice guy either. I was back in Sheridan this year, though I was not alone this time. Me and my travel partner Martin, whom I traveled to Montana with a couple of years ago, hooked up with Michael again and we had a magnificent start on this year’s Big Sky trip. Yet again, we brought some really nice fish to the net, generally while laughing. I missed the world famous eclipse since I was fighting a fearless brown at the time of the event. Then again, there was no trading on that one. Fall has arrived to my home town in the far north. Darkness is about to take over the neighborhood, The last of the red and yellow fall colors are fighting an unfair battle against time. A light chilly rain is falling on my head, dripping from the tip of my noose. If I hold my breath I can hear the vague sound of the river and if I close my eyes I can see that big trout rise. In my mind, I’m already planning the adventures of next year. I once again realize that I’m deeply in love with two different places in this strange world we live in. The little valley where my home river runs through the deep silent woods guarded by the mountains. And that other place, so far away from here. My home away from home. Montana. I live in the small town of Alvdalen in the central parts of Sweden where I run a fly shop and guide service with a good friend at Alvdalens Fiskecenter. I also write articles about fly fishing in a couple of Swedish Fly magazines and I never go anywhere without that camera hanging over my shoulder. A lot of my time is spent by the tying vise as well, tying flies both for my own fly box and at fairs in Europe. I was born and raised near river Osterdalalven and I’ve been fishing that river and its tributaries since I was a kid. Living with the woods, the rivers and the mountains a few steps from my door suits me perfect so I’m still here. Been fly fishing for more than 40 years now and my big passion in life is fly-fishing streams, creeks and rivers. Fishing for spooky trout is what it’s all about for me, even though I do hook up with a Arctic Grayling now and then. And every year, when fall arrives, I usually end up slinging bugs in Montana, USA.